HOUSTON  (September 21, 2010)  A post-homebuyer tax credit calm prevailed across the greater Houston area for the second straight month in August, with property sales volume down, though not as dramatically as it was in July. Despite the decline, the average price of a single-family home continued to climb. According to the latest monthly data compiled by the Houston Association of Realtors® (HAR), August sales of single-family homes throughout the Houston market fell 16.7 percent compared to August 2009. Declines were recorded in all pricing segments. The average price of a single-family home rose 2.2 percent from August 2009 to $216,522. The August single-family home median pricethe figure at which half of the homes sold for more and half sold for lessdipped 0.6 percent from one year earlier to $159,000. Foreclosure property sales reported in the Multiple Listing Service (MLS) dipped 2.4 percent in August compared to one year earlier. The median price of August foreclosure sales slid 1.1 percent to $85,000 on a year-over-year basis. Sales of all property types in Houston for August totaled 4,977, down 15.3 percent compared to August 2009. Total dollar volume for properties sold during the month was $1.0 billion versus $1.2 billion one year earlier, representing a 13.9 percent drop. "Our traditionally busy summer home sales months were much quieter because of the early spring home buying push that resulted from the tax credit, but Houston is still healthier than most other real estate markets around the country," said Margie Dorrance, HAR chair and principal at Keller Williams Realty Metropolitan. "It's hard to predict how our market will perform this fall, however consumers that have cash for a down payment and excellent credit who are considering purchasing a home can take advantage of record low interest rates and a selection of housing that suits every need and taste." The month of August brought Houston's overall housing market largely negative results when all listing categories are compared to August of 2009. Total property sales and total dollar volume fell on a year-over-year basis while the average single-family home sales price rose and the median price dipped. The number of available properties, or active listings, at the end of August rose 19.7 percent from August 2009 to 55,079. That represents 168 fewer active listings than one month earlier, in July 2010 and suggests that inventory levels are moving into balance. Month-end pending sales for August totaled 3,281, down 15.9 percent from last year, suggesting the likelihood that sales will be down again in September. The months inventory of single-family homes for August extended to 7.8 months compared to 6.4 months one year earlier, but remains healthier than the national months inventory of single-family homes of 12.5 months, reported by the National Association of Realtors® (NAR). August sales of single-family homes in Houston totaled 4,180, down 16.7 percent from August 2009, but an improvement from the 25.1 percent drop in July 2010. This marks the second monthly decline in sales volume after four consecutive months of accelerated sales activity. Broken out by segment, August sales of homes priced from $80,000 and below slid 2.0 percent; homes priced between $80,000 and $150,000 fell 20.8 percent; those in the $150,000 to $250,000 dropped 25.5 percent; homes priced between $250,000 and $500,000 declined 14.9 percent; sales of luxury homesthose priced from $500,000 to the millionstumbled 31.5 percent. On a year-to-date basis, however, single-family home sales are unchanged from 2009 levels. The average price of single-family homes in August was $216,522, up 2.2 percent compared to one year earlier. That's the second highest level recorded for an August in Houston. At $159,000, the median sales price for single-family homes slid 0.6 percent versus August 2009, but managed to reach its second highest level for 2010. The national single-family median price reported by NAR is $183,400, illustrating the continued higher value and lower cost of living that consumers enjoy in the Houston market. HAR also breaks out the sales performance of existing single-family homes throughout the Houston market. In August 2010, existing home sales totaled 3,467, an 18.3 percent decline from August 2009. The average sales price edged up 1.8 percent to $204,414 compared to last year while the median sales price of $148,000 declined 3.3 percent from its August 2009 level. The number of townhouses and condominiums that sold in August fell 13.4 percent compared to one year earlier. In the greater Houston area, 389 units were sold last month versus 449 properties in August 2009. 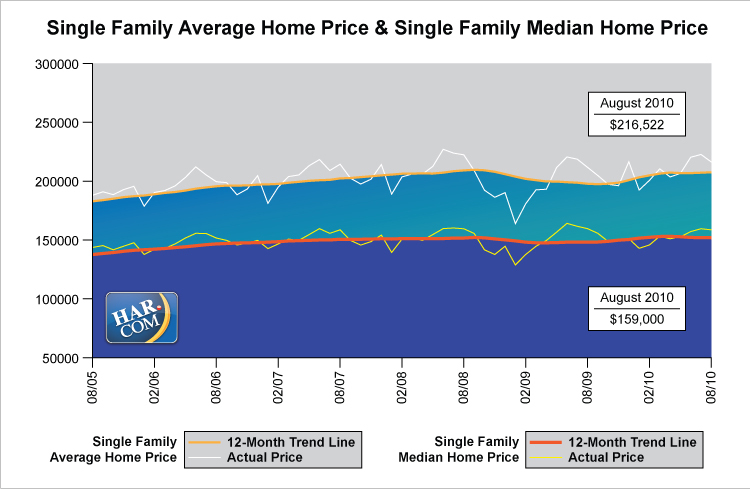 The average price was relatively flat at $153,613 from August 2009 to August 2010. The median price of a townhouse/condominium was also relatively flat at $121,750. Demand for single-family home rentals rose 17.5 percent in August compared to one year earlier. Year-over-year townhouse/condominium rentals increased 19.9 percent. 7.8 months inventory of single-family homes compares favorably to the national average of 12.5 months. Founded in 1918, the Houston Association of REALTORS® (HAR) is a 25,000-member organization of real estate professionals engaged in every aspect of the industry, including residential and commercial sales and leasing, appraisal, property management and counseling. It is the largest individual membership trade association in Houston as well as the second largest local association/board of REALTORS® in the United States.